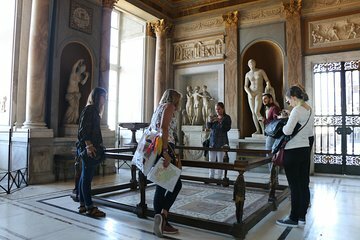 Beat the crowds at the Vatican Museums on this private, early-entry 3.5-hour tour that allows you to get inside before the general public. See the highlights of Vatican City, including the Sistine Chapel and St. Peter's Basilica, plus the Cabinet of Masks – a Vatican Museums section that is typically closed to visitors. Families traveling with children will be given a child-friendly guide. Meet your guide at 7:30am near the entrance of the Vatican Museums to begin your private tour. You'll gain entry into the vast museum at 8:00am, a full hour before the doors open to the general public, giving you a unique opportunity to see the incredible collections without the typical crowds. Listen as your guide explains the history of the Vatican, including the Vatican Museums. See all the highlights of the collections, plus the Cabinet of Masks. This gallery has gorgeous Roman mosaics on the floor and beautiful statues lining the halls, and it is usually closed to the public. Finish your Vatican Museums visit with a stop in the exquisite Sistine Chapel, decorated with Michelangelo's famous frescoes. Follow your guide through a skip-the-line walkway between the Sistine Chapel and St. Peter's Basilica to tour the enormous church. The tour ends in St. Peter's Basilica.